A unique row of brick townhouses dating to the 1880s runs nearly half the length of the block on Linden Street between Bushwick Avenue and Broadway. Richly detailed terra-cotta friezes of swirling, botanical patterns run across the two-story homes in unbroken bands that unify nearly a dozen identical façades into a contiguous entity. On the other side of the avenue stands 1019 Bushwick Ave., a boxy, red-brick mansion with a strikingly symmetrical façade. A round portico flanked by white columns makes it look a bit like a miniature White House. Built in 1900 and known as the Peter P. Huberty House after the original owner, the home is part of a row of detached mansions that serve as reminders of the wealth generated by German immigrants who developed the area in the late 19th century and established a successful brewing industry. The Huberty House and the Linden Street rowhouses are just two examples of the abundance of architectural treasures that give Bushwick Avenue a distinct historic flavor. The area’s significance was recognized in a 2011 study by graduate students at Columbia University who sought to lay the groundwork for several historic districts along the avenue and its side streets that would bestow landmark protection on all the buildings within their territories. Yet only three historic buildings have received landmark status in the years since the Columbia study, and there are still no historic districts within sight. One reason, say experts, might be the lack of organized advocates for preservation in the community. As the neighborhood undergoes rapid gentrification, Bushwick Avenue may be more vulnerable than ever to losing its historic gems. “Those mansions are sitting ducks,” said Carroll, one of the former Columbia students who contributed to the Bushwick Avenue study. Carroll and other preservationists who worked on the study explained that the zoning around the four-lane avenue allows for higher-density residential buildings than the housing stock of tenements, brownstones and widely spaced mansions built there more than a century ago. For real estate developers, that means “there’s a pretty good incentive to tear down,” said Ward Dennis, a professor of historic preservation at Columbia University’s Graduate School of Architecture, Planning and Preservation who led the class that produced the 2011 study. In a neighborhood with soaring rents, developers stand to make a lot more money by demolishing the old buildings and constructing modern apartment complexes that maximize capacity for market-rate tenants. According to reports by real estate brokerage firm MNS, the average rent for a one-bedroom in Bushwick rose to $2,053 in 2015 from $1,497 in 2011. 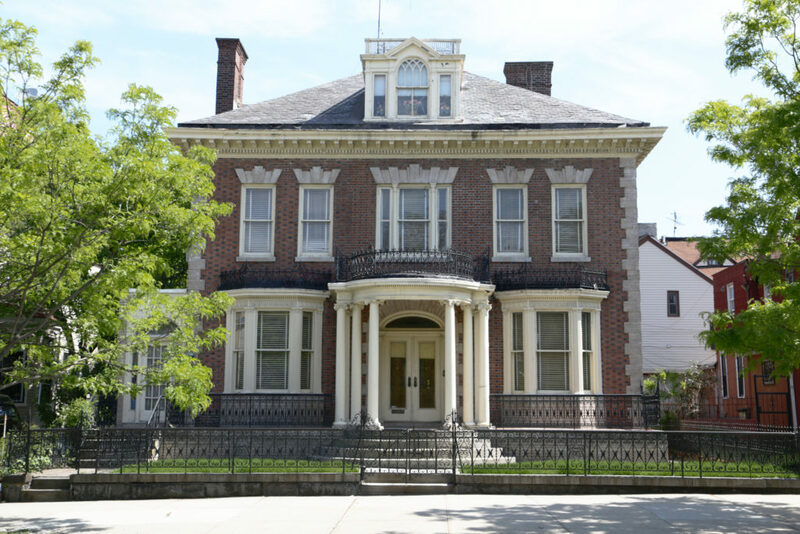 Two of the avenue’s recently designated landmarks—the Catherina Lipsius House at 670 Bushwick Ave. and the Doering-Bohack House at 1090 Greene Ave.—are mansions built during the beer-brewing boom days of the late 1800s. The third is the Ridgewood Masonic Temple at the corner of Bushwick Avenue and Gates Avenue. Many more worthy candidates remain unprotected. Local elected officials, like former city council member Diana Reyna and her successor in the 34th Council District, Antonio Reynoso, have supported the recent landmark designations, but landmark advocates cite a lack of grassroots community advocacy as a key factor limiting historic preservation efforts. “Lower-income neighborhoods hear landmarking and they equate that with gentrification and getting priced out of their neighborhood,” said Sarah Rosenblatt, a historic preservation architect who helped author the study. Some Bushwick Avenue residents oppose the idea completely. When the commission held a hearing to consider the Huberty House for landmark designation in 2013, the house’s owner,Virginia Giovinco, who has lived there all her life, attended the meeting to speak out against the proposal. The city’s Landmarks Preservation Commission said in a statement that it is still considering the Huberty House for designation as a landmark, but Giovinco said she hasn’t heard a word since the hearing. In the wider neighborhood, the Columbia preservationists said they encountered similar uneasiness when they met with members of the local community board. “There was a sort of fearfulness even with us being out there talking about this stuff,” said Carroll. “You have people coming out and poking around and looking at where you live — it makes people nervous, and I don’t blame them,” Carroll said. Community Board 4’s district manager, Nadine Whitted, described the board members’ reaction as a “mixed bag,” noting that many didn’t understand what landmarking even meant. Carroll and her colleagues said there’s no clear evidence that the presence of landmarks accelerates gentrification. Even without more extensive landmarking, the displacement of long-time Bushwick residents by increasing rents is already underway, Whitted said. She lamented some of the physical changes that have taken place as a result. It’s certainly also losing some of its history. Last year, a developer lopped off the 193-foot steeple of St. Mark’s Evangelical Lutheran Church on the northern end of Bushwick Avenue. The Columbia students had made a case for preserving the church as an individual landmark in their study. Now, it’s being converted into 99 rental apartments.